Monster iSport Livestrong in-ears help raise money for charity | What Hi-Fi? 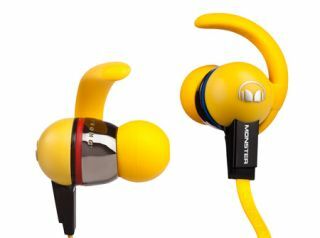 First unveiled at CES 2012 in Las Vegas, Monster is bringing its iSport Livestrong in-ear headphones to the UK. The bright yellow 'phones will go on sale in the US next month for $180, and will land over here in March/April – UK price to be confirmed. A portion of the sale proceeds will be donated to the Lance Armstrong Foundation, created in 1997 by the champion cyclist and cancer survivor to help those with the disease. The sweat-proof and washable in-ear headphones include a proprietary in-ear clip system to prevent them slipping out during strenuous exercise. There's also a custom-fit seal to provide a degree of noise isolation, and ControlTalk for inline control of smartphones so users can answer calls and control their music. Noel Lee, head of Monster, says: "Livestrong is one of the world's brightest lights in today's fight against cancer, and Monster is proud to support such a worthy cause." Find out more about Monster's forthcoming range of 2012 headphones in our CES report.